Whenever Students for Justice in Palestine (SJP) or other anti-Israel activists initiate a Boycott, Divestment, Sanctions (BDS) campaign, Jewish students become fearful of the accompanying antisemitism. This is exactly what happened in April 2018, at George Washington University (GWU), Washington, D.C. This Canary Mission report highlights the individuals behind an April 23rd-24th antisemitic BDS resolution that passed the GWU Student Association (SA), via secret ballot. 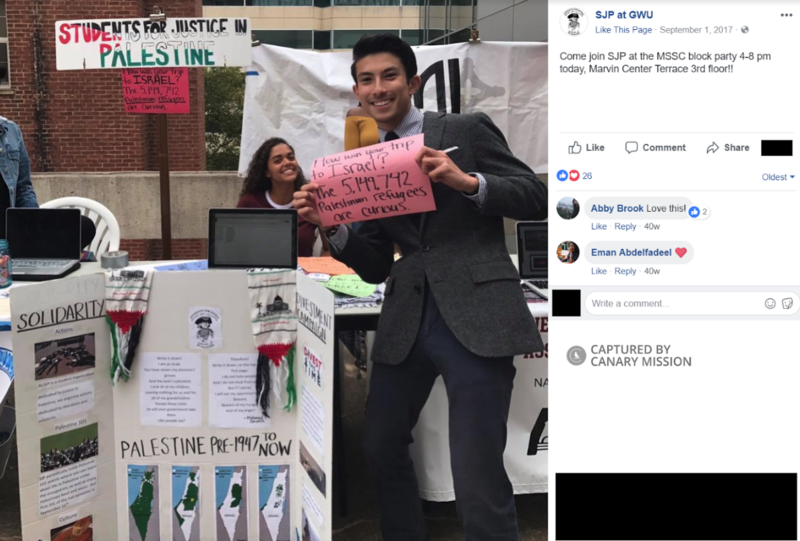 Activists with Students for Justice in Palestine (SJP) at GWU (SJP at GWU) led the BDS resolution campaign, titled “#DivestThisTime.” The campaign was SJP at GWU’s second in two years; their 2017 resolution failed to pass. Among the supporters of the 2018 resolution were SJP and BDS activists who made physical threats and used intimidation tactics. 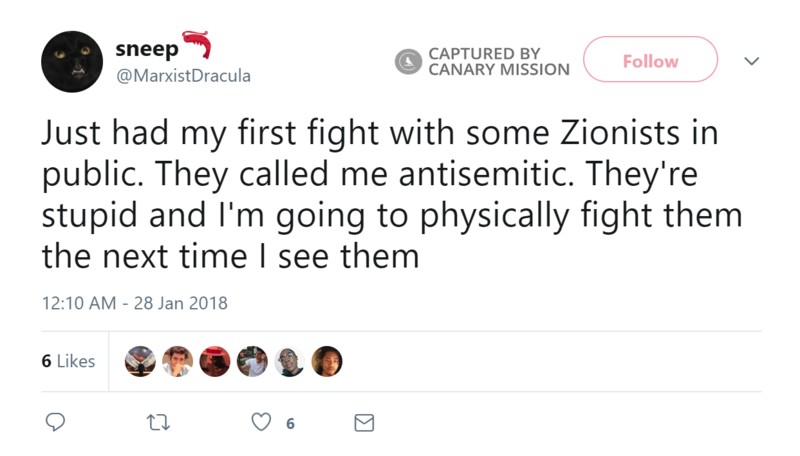 – Morgan Richmeier who tweeted that she would “physically fight” Zionists. – Henry Rosh who used the hashtag “#makezionistsafraid” on Instagram, after the resolution passed. The April BDS resolution hearing was marked by a unique incident. The SA broke to hold a closed-door censure vote on student senator, Brady Forrest, who had earlier that month been removed from his position as Senate Pro-Tempore, following revelations of antisemitic Facebook posts. Despite his explicit antisemitism, the SA failed to reach the two-thirds majority to censure Forrest. After the break, a number of Jewish students walked out [00:35:19] of the resolution hearing, protesting [00:33:21] the bill and the SA’s inaction to combat antisemitism within its own ranks. During the rest of the hearing, many Jewish students spoke [01:09:05] about their concerns [01:24:45] of antisemitism related to the #DivestThisTime campaign. One student spoke [00:50:40] about the Jewish community’s pain that the “hateful and divisive resolution was proposed over Passover.” One Jewish Israeli-American student said [00:48:05] it “creates an environment where I am made to feel that my identity is taboo” at GWU. – Liz Burkemper spread the blood libel that Israeli Jews poison Palestinian water. – Jeslyn Zakes characterized Israel’s defensive operations during the second Intifada and against Hamas as “random attacks” by Israel against Palestinians. Following the presentations from both sides, the SA voted [00:11:14] on whether to hold the resolution via secret ballot. The vote on the secret ballot passed and the resolution subsequently passed [00:21:53] with 18 votes for, six against and six abstentions. 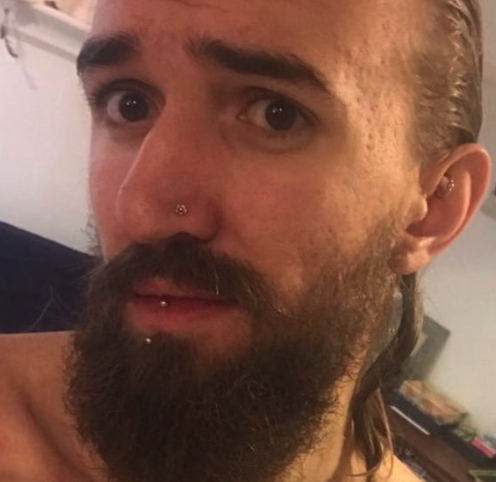 Morgan Richmeier has threatened to “physically fight” Zionists and called to “abolish the United States of America,” as an activist with SJP at GWU. She is also an activist with the anti-Israel Jewish Voice for Peace (JVP) organization. She has defended violent Hamas-led riots, spread hatred of Israel and condemned [00:07:40] the Birthright Jewish heritage tour to Israel. Richmeier spoke in favor [01:21:13] of the 2018 #DivestThisTime BDS resolution before the GWU Student Association (SA). As of June 2018, Richmeier’s Facebook page said she was studying International Affairs and Sociology at GWU, and that she planned to graduate in 2021. Henry Rosh has declared that BDS campus activism should “#makezionistsafraid.” Rosh has also expressed support for Hamas and other terrorists, called Israel “genocidal” and demanded the release of an activist who reportedly helped the Palestinian Authority (PA) torture and kill Arabs who sold land to Jews. Rosh was an SJP at GWU “coordinating committee” member during its 2017 #DivestThisTime BDS campaign. Rosh graduated from GWU in 2017 with a degree in Engineering. 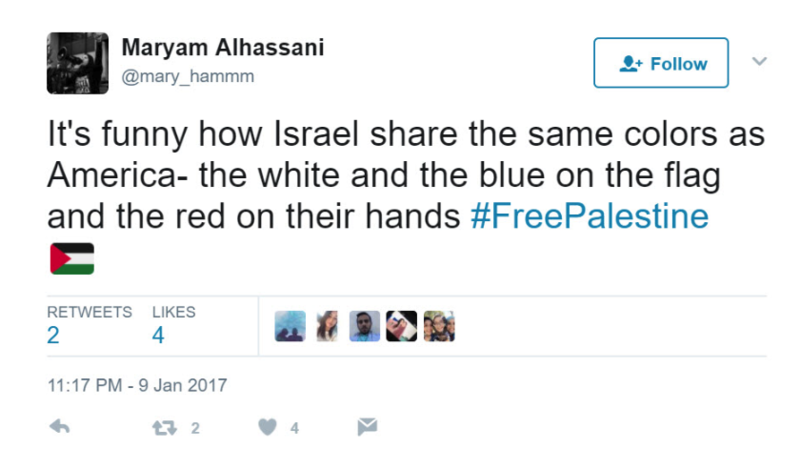 Alhassani was an SJP at GWU “coordinating committee” member in 2017. She spoke in favor [00:52:48] of the 2018 #DivestThisTime BDS campaign resolution before the GWU SA. She also spoke [00:01:33] in the 2017 #DivestThisTime video. As of June 2018, Alhassani’s Facebook page said that she was slated to graduate from GWU in 2020 with a bachelor’s degree in Peace Studies and Communications. Renad Uri has equated “DC zionists” with Nazis and called terrorist Leila Khaled “My president ” in October 2017. Uri also accused Israel of “genocide and ethnic cleansing” and endorsed violent Hamas-led riots. She was an SJP at GWU “coordinating committee” member in 2017. Uri promoted the 2018 and 2017 #DivestThisTime BDS campaigns at GWU. 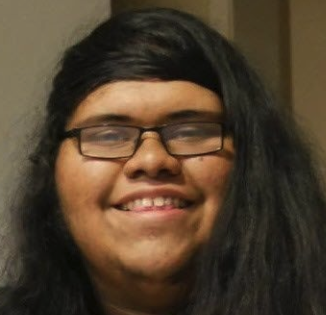 Joshua Gomez has expressed support for terrorists, tweeted that “the US and Israel are terrorist states” and called Israel a “fascist state,” as an activist with SJP at GWU. He has also demonized Israel and America and condemned [00:09:29] the Birthright Jewish heritage tour to Israel. Gomez co-sponsored the 2018 “#DivestThisTime” BDS resolution as a senator in the GWU SA. He spoke in favor [1:36:35] of the 2017 #DivestThisTime BDS resolution before the GWU SA. In June 2017, Gomez’s Facebook page said that he was a student at GWU, majoring in Political Science and Philosophy. Abby Brook has expressed support for terrorists and claimed [00:28:55] that Israel’s “structure is built on racist values” and “genocide.” She has also condemned [00:24:43] the Birthright Jewish heritage trip to Israel and spread hatred of the Anti-Defamation League (ADL) for its support of Israel. 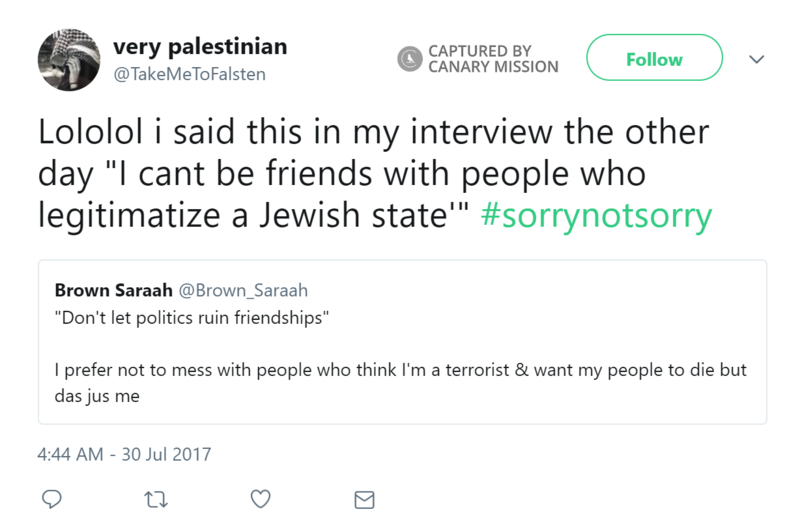 She was an SJP at GWU “coordinating committee” member in 2017. Brook spoke in favor [01:07:50] of the 2018 #DivestThisTime BDS resolution before the GWU SA and spoke [00:00:35] in the 2017 #DivestThisTime video. Brook also helped found JVP at GWU. In May 2018, Brook featured in an Instagram photo wearing a cap and gown the day following GWU’s commencement. However, as of July 2018, Brook’s Facebook page said she was a “student of International Affairs” at GWU. Kei Pritsker repeatedly nodded [00:14:39] and shouted [00:14:21] in agreement with anti-Israel and antisemitic statements at a 2017 anti-Israel rally. He has also expressed support for terrorists and condemned [00:48:35] the Birthright Jewish heritage tour to Israel. He was an SJP at GWU “coordinating committee” member in 2017. 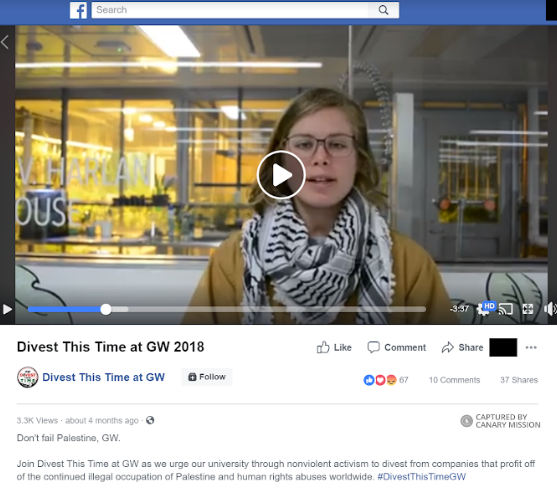 Pritsker spoke in favor [00:43:29] of the 2018 #DivestThisTime BDS resolution before the GWU SA and spoke [00:01:25] in the 2017 #DivestThisTime video. As of March 2017, Pritsker was reportedly a student at GWU. 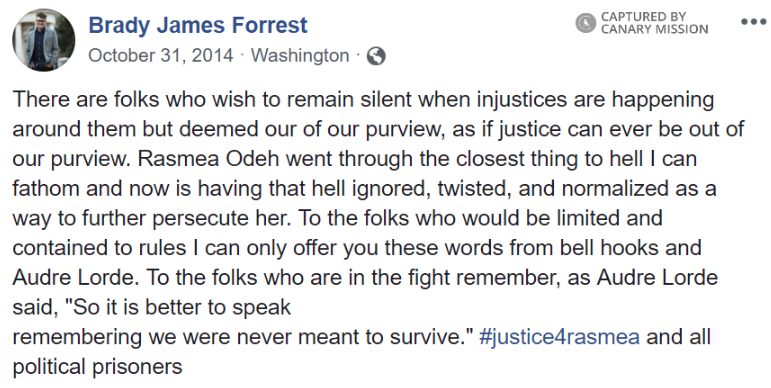 Brady Forrest [Brady James Forrest] was the sole sponsor of a GWU SA resolution glorifying terrorist Rasmea Odeh in 2014. 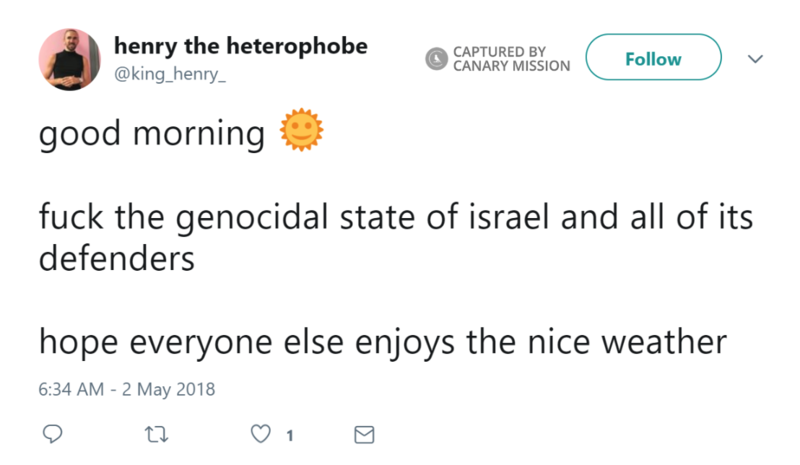 He was removed from an SA leadership position in April 2018 for antisemitic remarks he made in 2018 and 2014. 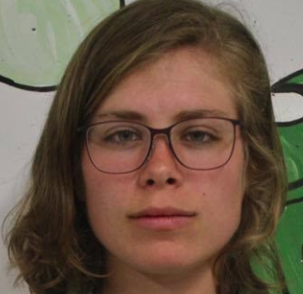 Forrest has recruited for SJP at GWU, been an activist with National SJP (NSJP) since 2014, promoted the BDS movement, demonized Zionism as “Satanic” and expressed support for disgraced antisemitic Professor Steven Salaita. As of July 2018, Forrest’s LinkedIn page said he was studying for a Ph.D. in Philosophy at GWU, and was slated to graduate in 2021. Raya Hudhud was a “coordinating committee” member of SJP at GWU in April 2017. She campaigned [00:01:37] on campus for the 2018 and 2017 #DivestThisTime BDS campaigns at GWU. For more info click here. Hana Kassem was a “coordinating committee” member of SJP at GWU in April 2017 and promoted the 2017 #DivestThisTime BDS campaign at GWU. For more info click here. Cecelia Halle has expressed support for terrorists and was a “coordinating committee” member of SJP at GWU in April 2017. As of July 2018, she was the “Administrative Contact” and “Potential New Members Contact” for the group. She spoke in favor [00:47:55] of the 2018 #DivestThisTime BDS resolution before the GWU SA. She also promoted [00:00:28] the 2017 #DivestThisTime campaign. For more info click here. Jessica Kiaraliza Martinez co-sponsored the 2018 #DivestThisTime BDS resolution, while serving as a senator in the GWU SA. Martinez accused [01:59:14] Israel of “murder, segregation and occupation” when speaking in favor of the resolution before the GWU SA. Martinez also promoted [00:01:42] the 2017 #DivestThisTime BDS campaign at GWU. For more info click here. Shaheera Jalil Albasit co-sponsored the 2018 #DivestThisTime BDS resolution, while serving as a senator in the GWU SA. Albasit accused [01:49:08] Israel of imposing “forced labor” on Palestinians when she spoke in favor of the resolution before the GWU SA. For more info click here. Eden Vitoff co-sponsored the 2018 #DivestThisTime BDS resolution, while serving as a senator in the GWU SA. Vitoff implied [01:53:01] that Israeli policy is to pollute Palestinian water and kill “children and other civilians,” when he spoke in favor of the resolution before the GWU SA. For more info click here. 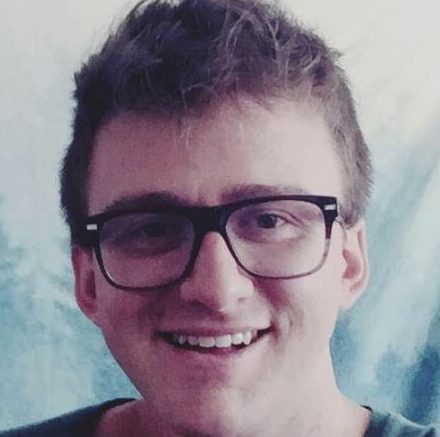 Tyler Katz has expressed support for terrorists and accused Israel of “genocide” as an activist with SJP at GWU. Katz said [00:01:33] in the 2018 #DivestThisTime BDS video: “Supporting Israel as the world’s only Jewish state is not harmonious with my Jewish values.” He also spoke in favor [00:53:03] of the 2018 #DivestThisTime BDS resolution before the GWU SA. For more info click here. 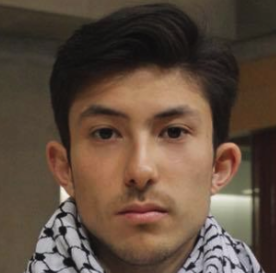 John Kim has expressed support for terrorists and accused Israel of “genocide,” as an activist with SJP at GWU. He accused [01:15:14] companies doing defense work with Israel of “murder,” when he spoke in favor of the 2018 #DivestThisTime BDS resolution before the GWU SA. He also spoke [00:00:22] in the 2017 #DivestThisTime promotional video. For more info click here. 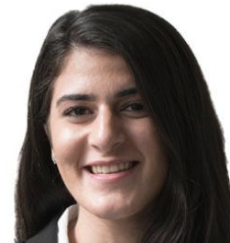 Keiko Tsuboi has expressed support for terrorists, whitewashed Hamas-led riots and accused Israel of “racism, colonization and apartheid,” as an activist with SJP at GWU. She sponsored the 2017 #DivestThisTime BDS resolution as a senator in the GWU SA. She also spoke in favor [00:20:46] of the 2018 #DivestThisTime BDS resolution before the GWU SA. For more info click here. 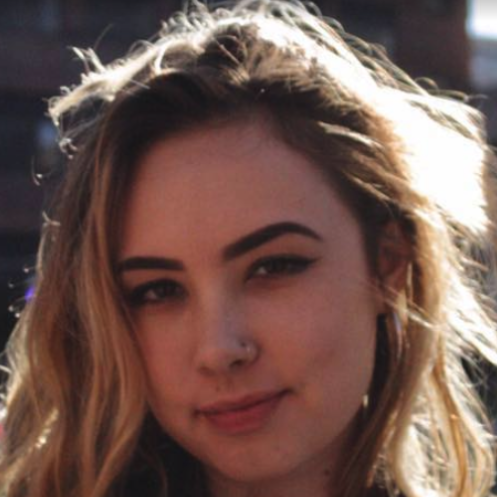 Rebecca Lewis [Becca Lewis] has claimed that there is “israeli apartheid in Palestine,” as an activist with SJP at GWU. Lewis spoke in favor [00:39:50] of the 2018 #DivestThisTime resolution before the GWU SA. She also condemned [00:07:40] the Birthright Jewish heritage tour to Israel. For more info click here. Grace Krikie has expressed support for terrorists, accused Israel of “apartheid” and spread hatred of America. She claimed [01:26:00] Israel has been “displacing millions of Palestinians from their homes” when she spoke in favor of the 2018 #DivestThisTime BDS resolution before the GWU SA. She is also affiliated with SJP at GWU. For more info click here. Matthew Zimmer has expressed support for terrorists and spoke in favor [00:25:08] of the 2018 #DivestThisTime BDS resolution before the GWU SA. For more info click here. 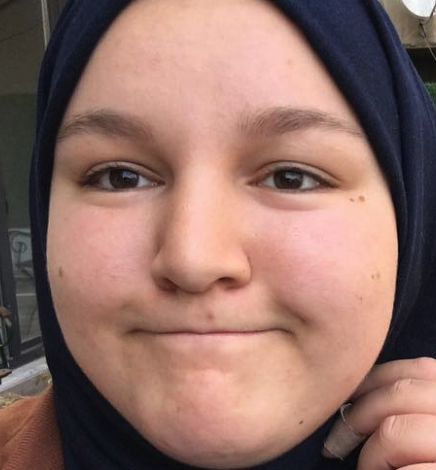 Alaina Taylor has expressed support for terrorists as an activist with SJP at GWU. She spoke in favor [01:17:42] of the 2018 #DivestThisTime BDS resolution before the GWU SA, where she demonized the Israeli-Egyptian blockade of Gaza. For more info click here. Jeslyn Zakes characterized Israeli operations during the second Intifada as “random attacks” by Israel, when she spoke in favor [00:31:54] of the 2018 #DivestThisTime BDS resolution before the GWU SA. She is also affiliated with SJP at GWU. For more info click here. Liz Burkemper [Elizabeth Burkemper] has expressed support for terrorists as the financial contact for SJP at GWU. She accused [01:02:47] Israel of the “poisoning of water in Palestine” when she spoke in favor of the 2018 #DivestThisTime BDS resolution before the GWU SA. She also spoke [00:00:24] in the 2017 #DivestThisTime video. For more info click here. Frank Fritz has expressed support for terrorists as an activist with SJP at GWU. He featured [00:01:39] in the 2018 and 2017 [00:00:23] #DivestThisTime BDS campaign videos. For more info click here. Noor Chaudhry spoke in favor [01:32:38] of the 2018 #DivestThisTime BDS resolution before the GWU SA. At the time, she was a leader of a GWU student group that endorsed the resolution. For more info click here. Emily Parker presented in favor [01:32:38] of the 2018 #DivestThisTime BDS resolution before the GWU SA. At the time, she was a leader of a GWU student group that endorsed the resolution. For more info click here. Annabel LaBrecque spoke in favor of the 2018 #DivestThisTime BDS resolution before the GWU SA, where she accused [00:18:29] Israel of “corporatized exploitation and colonialism.” She is a leader of a GWU student group that endorsed the resolution. She appeared [00:02:30] in the 2018 #DivestThisTime video. For more info click here. Erica Jung spoke in favor of the 2018 #DivestThisTime BDS resolution before the GWU SA, where she accused [01:41:46] Israel of “apartheid and colonialism.” At the time, she was the leader of the Young Democratic Socialists of America (YDSA) chapter at GWU, which endorsed the resolution. For more info click here. Elizabeth Rhoads [Biz Rhoads] promoted the 2018 #DivestThisTime BDS campaign at GWU. She is affiliated with SJP at GWU. For more info click here. Theresa Ranni voted to hold the 2018 #DivestThisTime BDS resolution via secret ballot, as a senator in the GWU SA. For more info click here. Ojani Walthrust voted to hold the 2018 #DivestThisTime BDS resolution via secret ballot, as a senator in the GWU SA. His LinkedIn page said he is “The George Washington University 2018-19 Executive Vice President.” For more info click here. McKenzie Swain voted to hold the 2018 #DivestThisTime BDS resolution via secret ballot, as a senator in the GWU SA. For more info click here. Kathleen Harrington voted to hold the 2018 #DivestThisTime BDS resolution via secret ballot, as a senator in the GWU SA. For more info click here. Jan Yonan voted to hold the 2018 #DivestThisTime BDS resolution via secret ballot, as a senator in the GWU SA. For more info click here. Kate Schutte [Catherine Schutte] voted to hold the 2018 #DivestThisTime BDS resolution via secret ballot, as a senator in the GWU SA. For more info click here. Andrew Lama voted to hold the 2018 #DivestThisTime BDS resolution via secret ballot, as a senator in the GWU SA. He was the chairperson of the SA Student Life Committee. For more info click here. Katherine Perroots voted to hold the 2018 #DivestThisTime BDS resolution via secret ballot, as a senator in the GWU SA. For more info click here. Olivia Eckstein voted to hold the 2018 #DivestThisTime BDS resolution via secret ballot, as a senator in the GWU SA. For more info click here. Niyati Shah voted to hold the 2018 #DivestThisTime BDS resolution via secret ballot, as a senator in the GWU SA. For more info click here. Jabari Link voted to hold the 2018 #DivestThisTime BDS resolution via secret ballot, as a senator in the GWU SA. For more info click here. Jewish Students Speak About Anti-Semitism at GWU from Canary Mission on Vimeo.